I recently got a Pebble Time smartwatch. You can get them for pretty cheap right now (~50$ new. Some models and colors are more, though), especially since Pebble was bought out by FitBit. 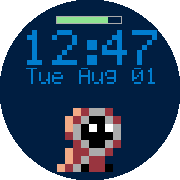 I decided to make some Pebble apps in C, but then it hit me: why not make a Sorcery-themed watchface? So I worked using cloudpebble.net to make these Pebble C projects. Just saying, it's a really cool tool for anyone interested in this sort of thing. Here's v2.2 of that. Download here for the direct, here for the Pebble App Store link, or download from the .zip attached below. You can find the source here if you want, as well. You should make him move across the screen and play the fighting animation randomly, checking every second. That would be pretty cool, to have some animation! I'd have to learn all that stuff though, lol. On top of that, it wouldn't be a good idea to check every second, since that drains more battery. I'd probably do it every minute. I've added a battery bar, charging indicator, and bluetooth disconnect reminder! It's got quite the impressive featureset now. Basically enough to classify as a functional, partially helpful watchface. Coming soon will be month/day and day of the week. I've added compatibility to Pebble Time Round, today's date, and new screenshots to prove it! v2.1 is now out.